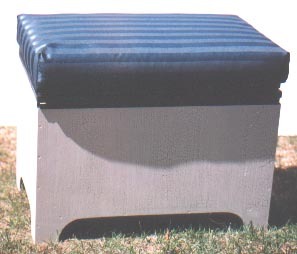 Footstool / Coffee Table: The cushion has a removable cover for easy cleaning. The cushion is Velcro'd to a piece of wood (which is removed when opened) and which sits inside the leg portion of the extension table (see next picture) so it doesn't move around. The material looks bluish in the picture, but is really a nice dark green - jacquard pattern of satin and matt stripes. 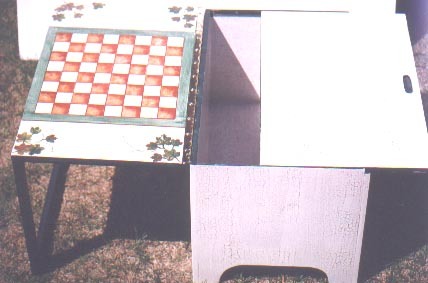 The outside and game table sections are painted an off white with dark green crackle finish. (I still have to do the decorative painting on the outside (more pictures to come eventually). Open View: The leg I mentioned above is on the left portion on the picture. 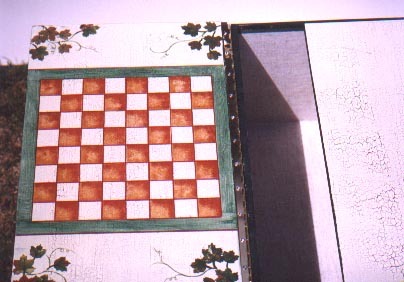 A checker board and ivy leaves (detail below) enhances one side. The interior for game storage is papered with a linen look Mac Tac. 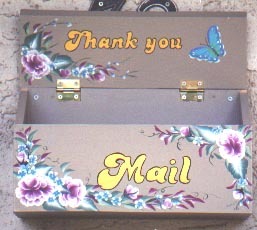 The top lid which slides out to open, is also crackled� with the off white and green (too much sun). The cut out for the legs of the main box makes it less chunky feeling. 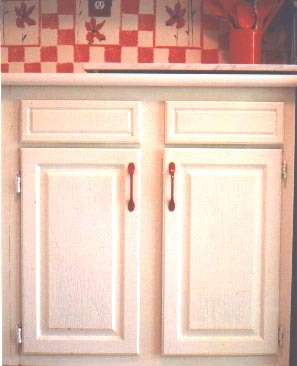 Left view: Painted with purple and white pansies. 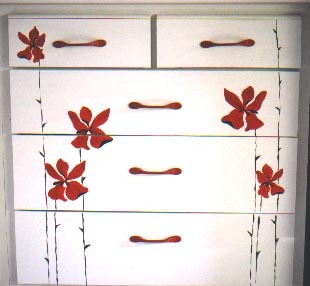 Right view: Painted with a variation of wild roses. Front and top of lid view: The top of lid has a white Dogwood branch. 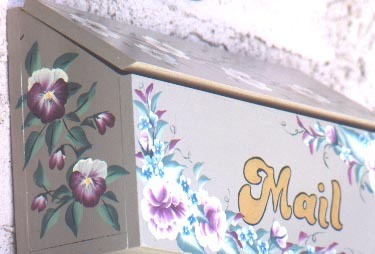 The front has stylized purple/white roses, buds and small blue/white flowers. 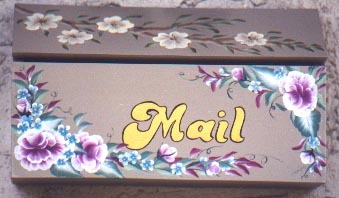 The word Mail is done painted with a bright gold paint and outlined in black. 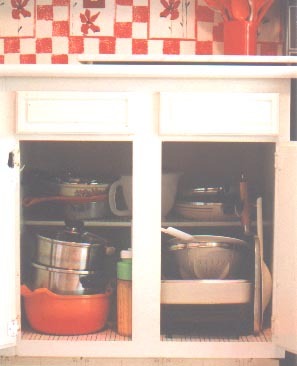 Before and after pictures of my pots and pan cupboard. The doors were plastic - now they're wood. No more bending and stretching trying to get a pot out of the back. Personally I find indentations and molding just dust collectors. More work to clean... Does this look like a pain or what??? I have now added new pictures (April 15, 2001) of the front door window. Glass is a very difficult item to photograph and is impossible to get all the aspects of a window in one photograph. 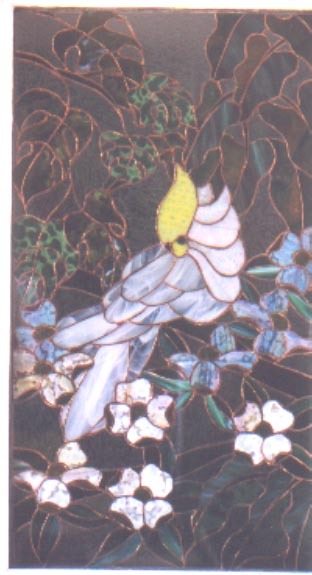 The picture below, which is the right side view, shows some of the feather detailing and the pink/blue flowers more clearly. The background glass is more evident and is a glue chip glass. Again the brownish flowers are a more golden color. There is a huge difference between the right side and back side of the window. The picture on the right is the back side of the window and you can see the brownish flowers have a white mottled look now. 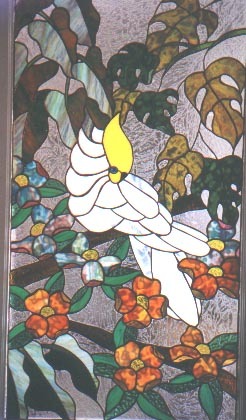 The wispy glass is very apparent also and really gives the illusion of feathers. Some of the upper leaves in the right side are an olivey green whereas on the backside they are a more bluish green. The first picture is a view of the whole window box. The other pictures are close-ups of each flower section going from left to right. This window box sits under my living room window and is 6' long. 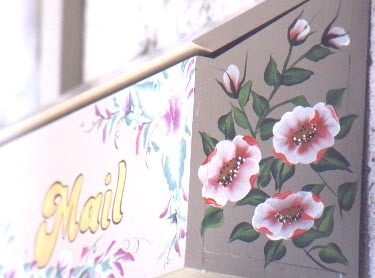 (April 15, 2001) The first picture is a view of the whole window box. The other pictures are close-ups of each flower section going from left to right. 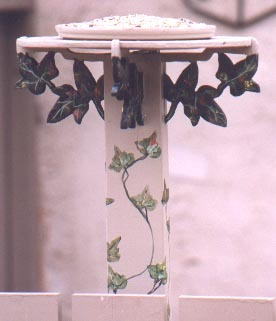 This is a bird feeder I made and decorated. It stands 4' high and is screwed into one of my fence posts. The ivy leaves that hold the platform for the clay dish are done in scroll work and are embedded into the 2x4 piece of wood. 1st picture is a view of the whole planter. 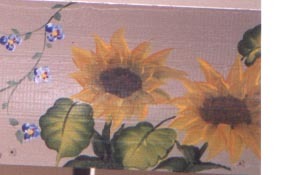 The next three pictures are enlarged detailing of left, central and right sections of the planter.